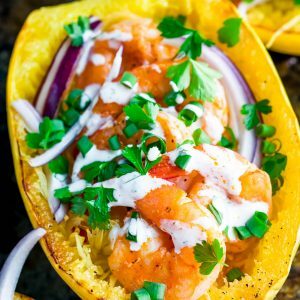 This crazy delicious Buffalo Shrimp Spaghetti Squash with Paleo Ranch Dressing is Whole30 compliant and gloriously gluten-free. Love it so! So I’m basically typing this at super speed trying to get this recipe into your hand as fast as humanly possible. Why? Because it’s SO FLIPPING GOOD. Like, text your bestie and insist they come over for an impromptu buffalo shrimp spaghetti squash themed dinner party sort of good. Yes that is most certainly a thing now that this recipe exists. I contemplated letting my husband hand model for these photos like he did with my last stuffed spaghetti squash creation but I couldn’t afford to risk him eating it all before I finished snapping photos. As it was, I couldn’t keep my hands off it! There were supposed to be four squash halves in the photos but it seemed like a WAY better idea to shoot 3 while eating the 4th. Don’t worry, I warmed up a bowl for Paul after I was done. Though mayyyyyybe let’s not tell him that I ate half of his shrimp before handing it over. Since this bad boy ended up being accidentally paleo, I figured I’d take things a step further and make the ranch dressing paleo too. It’s even Whole30 compliant – woot! I took my go-to ranch dressing recipe and swapped coconut milk for the buttermilk and HOLY COW the results were amazing. I’m not sure I ever want to go back to making non-paleo ranch dressing now… it’s just so stinkin’ tasty! 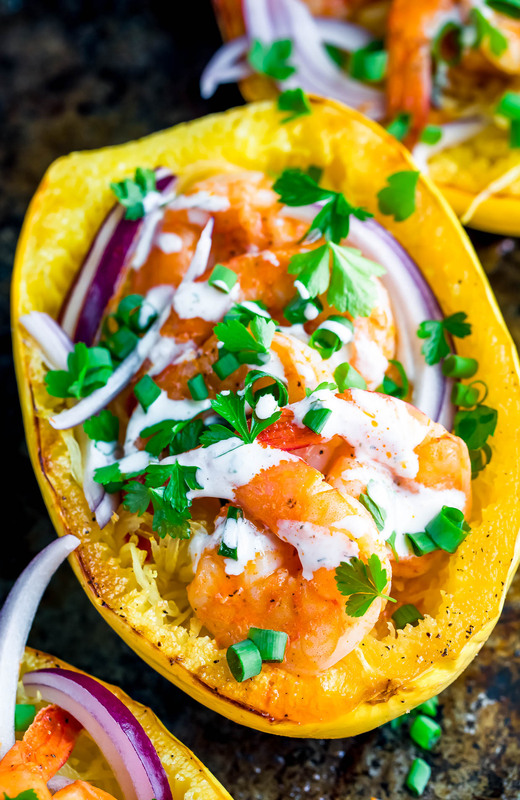 This crazy delicious Buffalo Shrimp Spaghetti Squash with Paleo Ranch Dressing is Whole30 compliant and gloriously gluten-free. Love the dressing? This easy peasy paleo ranch dressing can be doubled and used for salads too! Homemade dressing keeps in the fridge for several days, making it great for meal prep. Slice the stemmed edge off your spaghetti squash (to give yourself a flat base to place on the cutting board) then slice in half lengthwise and scoop out the seeds. Repeat for each squash. Next grab a lipped baking sheet. Rub the cut side of the squash with olive oil or butter and place on your baking sheet and roast face-down for about 30 minutes, or until tender and easily pierced with a fork. Cooking time will vary a bit depending on the size of your squash: Two 1.75 lb spaghetti squash will take about 30-35 minutes. While the squash roasts, prep your dressing + shrimp. For the dressing, combine all ingredients in a mason jar and shake well. Place in fridge to chill. The dressing can be made in advance and enjoyed for approx. 4 days. Heat a large pan or skillet to medium-high heat with 2 TBSP of butter and sauté your shrimp. Season with paprika, salt, and black pepper to taste. Cook on each side for about 2 minutes until shrimp curl and become opaque. The cook time will depend on the heat setting you choose and the size of your shrimp, but regardless they’ll be perfectly cooked in a matter of minutes. 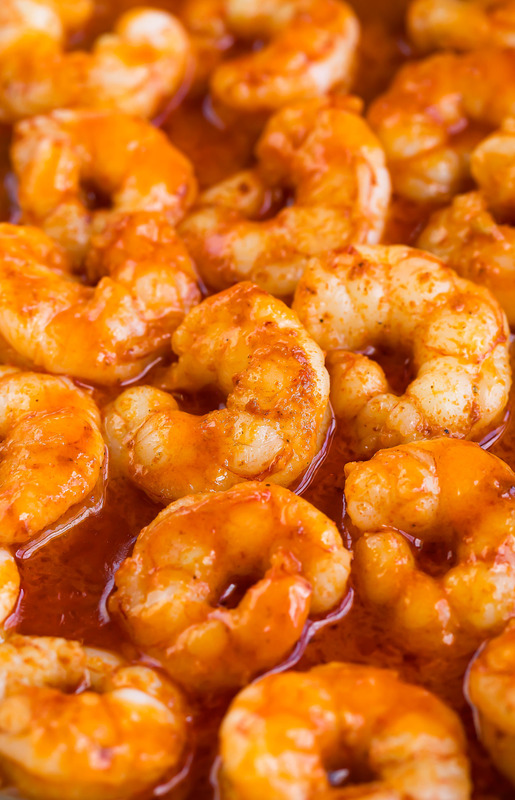 Add your hot sauce to pan and mix to coat while the shrimp are still hot. 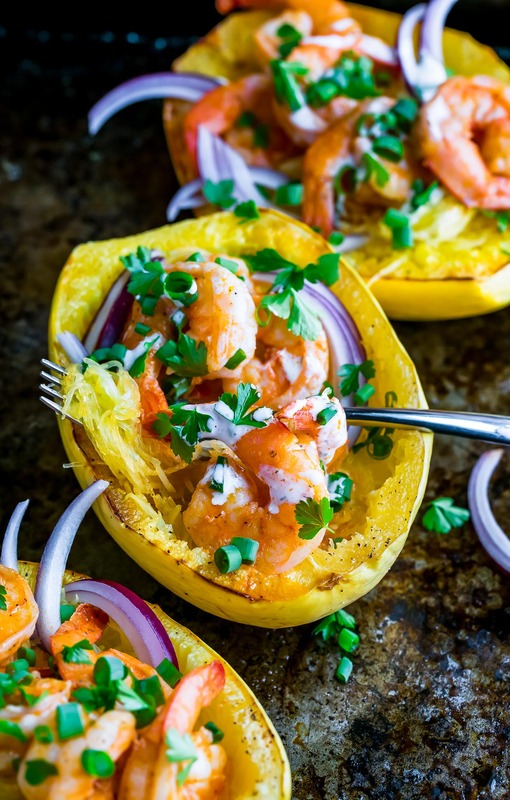 Add your buffalo sauced shrimp to each squash boat (or plate) and drizzle the remaining sauce over each. Top with red onion (I like mine raw but you can add pickled onion or sautéed onion if desired!) and a sprinkling of fresh herbs. Serve with ranch dressing and extra hot sauce for drizzling. YUM! * I only had large shrimp on hand, but feel free to go with smaller shrimp. They'll be cheaper and will ensure you'll get lots of buffalo shrimp goodness in every bite! ** For Whole30 simply make sure you're either making your own or using a compliant paleo mayo and you're good to go! If you don't need this easy peasy recipe to be paleo or whole30 compliant, feel free to use regular unsalted butter! Have a large spaghetti squash on hand? You can easily make this with a 3 or 3.5 pound spaghetti squash. Bake time for the large roasted squash halves will be around 40-45 minutes, or until strands are tender and easily separated by a fork. Adjust cook time accordingly and you're good to go! 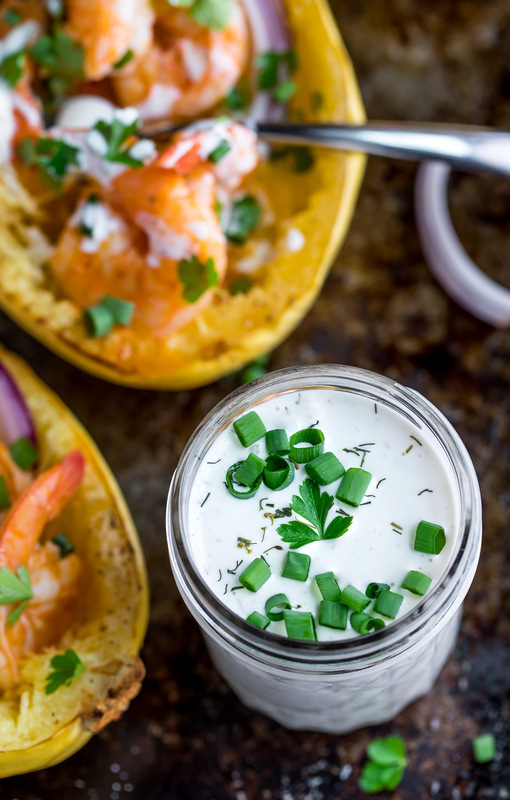 If you get a chance to try this Buffalo Shrimp Spaghetti Squash with Paleo Ranch Dressing, let me know! 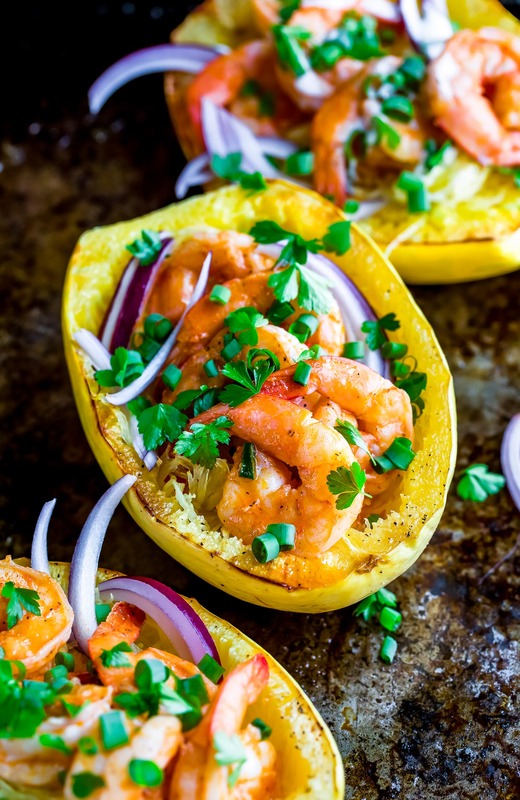 Check out even more spaghetti squash goodness with our round-up of 7 delicious ways to stuff a spaghetti squash. Looking to start our whole 30 program and trying recipies before we start. This dish has so much flavor its hard to believe its actually healthy. We also made the mayo from avocado oil and then made the ranch dressing from that. WOOT! Glad it was a hit – thanks Mike! Holy moly! We just started a doctor mandated change in eating habits. I couldn’t believe when my sister sent me this recipe to try how it fit every box Im supposed to have! Not only did it fit into our diet plan, but it wasnt diet tasting… the flavor was so good we scraped up every bit to the last bite and it filled us up so we weren’t hungry in an hour! You are a lifesaver! Keeping this on the menu A LOT!! So glad it checked all the boxes for you Michele and that you enjoyed the recipe! So happy to hear it! I love making spaghetti squash! Everything about this sounds so amazing! This looks amazing! I’m always up for new, healthy recipes like this one. Thanks for sharing!